Other Products: Maroon Archival Ink, Pink card stock, Hot Glue Gun, Water Mister, Bone folder, Paper distressing tool, Water coloring brush, Scissors, Rule, Fussy Cutting Scissors, Double sided Tape, Double Sided 3d Foam Tape, Pink ribbon, Misti stamping tool, Zutter bow maker, Crop-a-dial, Versa-mark, Clear embossing powder. Instructions: Click here to go to my blog for more detailed photos. The finished size of this Z card is 7.28" x 17" (18.5cm x 15cm). Taking the white cardstock and cut for the card base 5.82" x 12"(14.8 cm x 30.5cm) Make folds at one end, 2.36"x 4.72" (6cm and 12cm) this will be the card foot. Taking the pink card stock cut a card front measuring 4.13 x 7.48" (10.5cm x 19cm). Make a fold in one end for a hinge. .059" (1.5cm) Center this, and adhere the hinge to the front top edge of the card base. Taking the pink card stock cut the matting for the card base and the foot folds of the card. Cut the matting a little smaller than the white card stock. Find from the paper collection the design with the Peonies and the flowerbed scenery. Cut a second layer of matting for the card with this cutting a little smaller than the pink card stock. Adhere all layers of the matting to the card front but before adhering the inside card front pink card stock and paper print, first wrap the ribbon around both layers and adhere in place then adhere both layers to the card base. For the inside sentiment and decoration; cut from the pink cardstock for the inside card sentiment 3.74" x 5.70" (9.5cm x14.5cm). Taking a piece of white card stock cut this to 2.16" x 3.34" (5.5cm x 8.5cm). Taking the stamp with the sentiment and Maroon ink, stamp the sentiment and diecut. Adhere in place with 3D foam tape. Taking the 'Peony Bud and Blossom' stamp and matching die sets stamp, die cut and color both sizes of the peonies. Adhere these in place with the 3d foam tape. To make the flowers use the stamps and dies for the Sweet Peonies, stamp using the Archival inks and white card-stock. Bring color to the stamped flower petals and leaves with the 3D stamping inks. This will give a beautiful metallic sheen to your flowers. Taking the Crop-a-dile, make a small hole in the center of each petal. 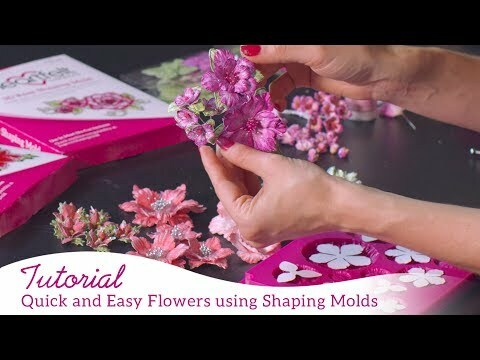 Using the flower shaping molds bring shape to the petals. The rose flower-shaping mold was used for the peonies. The yellow stamens are used for the peony centers. Thread the stamens through the holes as you stack the flower petal layers. See the video to see how this is done. Use the clear drying glue to apply the glitter to the flower petals and leaf veins. To decorate the card front flap, make a triple bow from the ribbon with aid of the Zutter bow maker. Adhere this to the front flap. 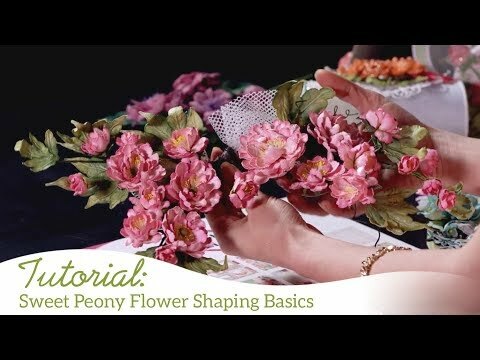 Arrange the flowers in a cluster tucking the peony buds and leaves under the bow and flowers and adhere. Once all the embellishments are secured to the card front flap adhere the sentiment to the top of the flowers with the hot glue gun. Using the white card stock, stamp the 'Praying For You' with the maroon ink, then heat set with the clear embossing powder. Die cut the sentiment with the matching die. Color the sentiment with a green wash from the moss green stamping paint. Apply a little clear drying glue across the card front flap and card front, sprinkle the glitter and leave to dry.